It is no secret that I dislike apostrophes and would abolish them if I had the power to do so. Hyphens, on the other hand, are a different matter. They have a useful purpose in indicating compound words. A Spanish-English dictionary is one that describes the two languages while a Spanish English teacher is a person of Spanish nationality who teaches the English language. 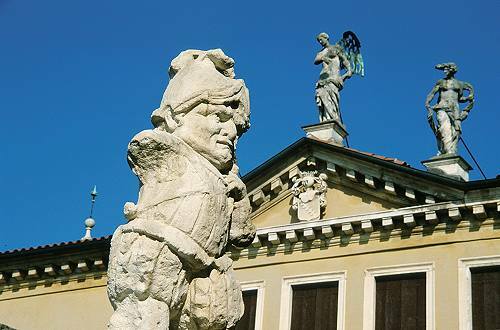 An unwanted hyphen, introduced during the editing process, had us claiming in our print edition that the Villa Valmarana ai Nani in Vicenza, Italy, was “named for the 17-stone ‘nani’, or dwarfs, that surround the home” To clarify: there are 17 dwarf statues surrounding the villa, they are made of stone, and we’re not sure how much they weigh. An imperial ton is thus 2,240 lb (believe me, I learnt it all by heart at school along with rods, poles and perches for measuring land, and a mile is 1,760 yards, 5,280 feet or 63,360 inches). Coincidentally but conveniently, the metric tonne of 1,000 kg is equivalent to 2,205 lb. The two words ton and tonne are distinguished in spelling but are both pronounced /tVn/. This is the avoirdupois system. Precious metals are weighed in the Troy system, where a pound is 12 pounces or 5,760 grains. There is no likelihood of the UK adopting the metric system in any foreseeable future. The original editor of The Hobbit “corrected” Tolkien’s plural dwarves to dwarfs, as did the editor of the Puffin paperback edition of The Hobbit. According to Tolkien, the “real ‘historical’” plural of dwarf is dwarrows or dwerrows. He referred to dwarves as “a piece of private bad grammar”. In Appendix F of The Lord of the Rings it is explained that if we still spoke of dwarves regularly, English might have retained a special plural for the word dwarf as with goose—geese. Despite Tolkien’s fondness for it, the form dwarrow only appears in his writing as Dwarrowdelf, a name for Moria. Tolkien used Dwarves, instead, which corresponds with Elf and Elves. In this matter, one has to consider the fact that the etymological development of the term dwarf differs from the similar-sounding word scarf (plural scarves). The English word is related to old Norse dvergr, which, in the other case, would have had the form dvorgr. But this word was never recorded, and the f/g-emendation (English/Norse) dates further back in language history. Connoisseurs of this arcane subject will appreciate the alternating double and single quotation marks in nested quotations in both the above pieces from the Guardian and Wikipedia. If the spelling had not changed to match the pronunciation, we'd probably write dwargh, like laugh. In both cases, final /x/ went to /f/ rather than disappearing altogether. As it happens, scarf 'strip of cloth' is a borrowing from Normand escarp, whose plural changed by analogy with elf, leaf, self, calf, half, etc. By the way, an American would understand "17-stone dwarfs" as dwarfs made using seventeen stones.